Io is the fifth moon of Jupiter and the fourth largest moon in the solar system. It is the innermost of the Galilean moons that orbit Jupiter. Io is the most volcanically active body in the solar system, spewing out sulphur as high as 300 km (190 miles) in the air. Like Europa, Ganymede and Callisto, Io was discovered in 1610 by the Italian scientist Galileo. Io was the first discovered moon after Earth’s moon. Galileo Galilei discovered Io on January 8th, 1610 and the discovery, along with the three other Jovian moons Europa, Ganymede and Callisto, were the first moons discovered that were orbiting a planet other than Earth. Technically, Galileo discovered Io the night before, but he wasn’t able to distinguish between Io and Europa until the following night. The discovery of Io and the Galilean moons led to the understanding that planets orbit around the Sun – and that Earth was not the centre of our solar system. The moon is named after a nymph seduced by Zeus in Greek mythology. Io was a nymph loved by the Greek god of the skies, Zeus, and the planet which was formerly known as Jupiter I was named for this nymph in the mid-1800s. In the mythological story, Zeus turned Io into a heifer (a cow) to hide his infidelity from his wife Hera. Everything we know about Io comes from the Voyager and Galileo spacecraft missions. A number of spacecraft have flown past the planet Jupiter and its moons – sending back images and a lot of information about the Jovian worlds. Pioneer 10 was the first spacecraft to visit in 1973, and was followed shortly after by Pioneer 11 in 1974. The Voyager 1 and Voyager 2 missions were the first to return photos of Io and the Jovian worlds during their flybys. The Galileo spaceprobe arrived at Jupiter in 1995 after a six year flight and passed as low as 162 miles (261 km) over the surfaces of the Galilean moons, producing the detailed images of the objects we have today. NASA describes Io as “a giant pizza covered with melted cheese and splotches of tomato and ripe olives”. The interior of Io is made of an iron or iron sulfide core but its brown silicate outer layer which gives the planet its distinctive splotchy orange, yellow, red, black and white appear is the most interesting and noticeable. The colorful appearance is down to the silicates (such as orthopyroxene), sulfur, and sulfur dioxide which frosts the surface and forms the yellow to yellow-green regions. Radiation on Io is 1000x stronger than is needed to kill a human being. Io lies in the doughnut-shaped plasma cloud around Jupiter, known as the “Io plasma torus” which is the result of Jupiter’s very strong magnetic field. As Io rotates, this torus strips ions from Io as it rotates, effectively making it an electrical reactor which produces radiation levels so strong that a human being could not survive. Io receives about 3,600 rem (36 Sv) of radiation per day. Doses greater than 100 rem received over a short time period would result in death in just a few weeks. Io has over 400 active volcanoes. Io is the only world other than Earth that is observed to have active volcanoes and is the most geologically and volcanically active object in the solar system. Volcanic plumes can rise 300 km (190 miles) above the surface. This was originally discovered by NASA’s Voyager 1 mission in 1979. The reason for this volcanic activity is the tidal heating which happens as Io is stretched and squeezed while it orbits Jupiter. This tidal bulge also shifts Io’s surface up by as much as 100 m throughout it’s orbit. The irregular orbit of the moon around Jupiter increases the tidal activity which is what makes the moon so volcanic. Io has mountains larger than Mount Everest. The surface of Io is dotted with more than 100 mountains – a result of the compression at the base of its crust that uplifted the surface. Some of these peaks are taller than Mount Everest. These mountains have an average height of 6 km (4 miles) and a large average length of 157 km (98 miles) long. Io is composed of silicate rock surrounding a molten iron or iron sulfide core. 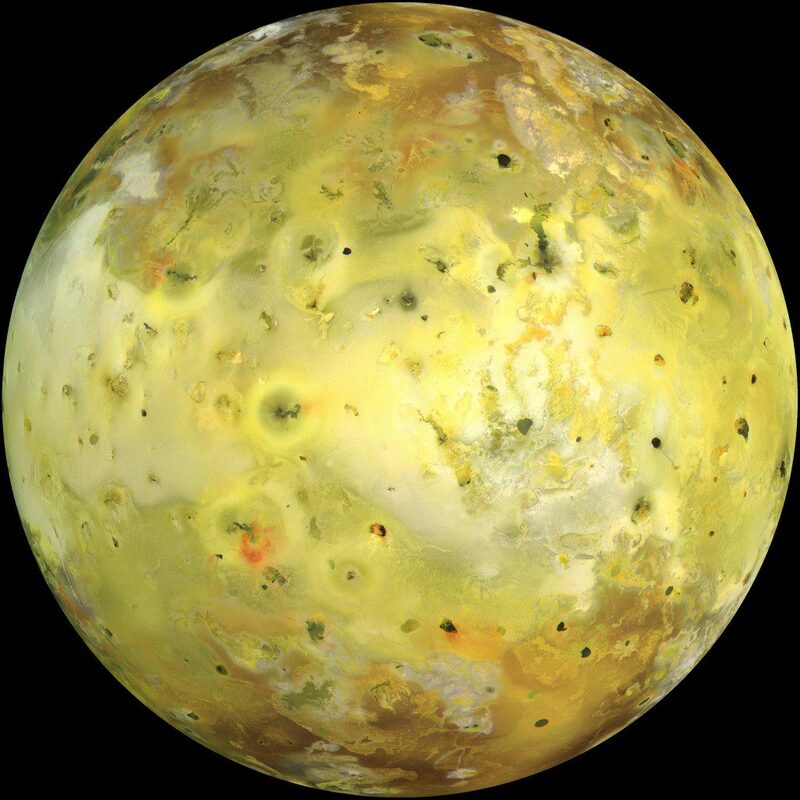 While most moons in the outer solar system, like Callisto for example, are made up of mostly water ice and rock, Io is composed of silicate rock which surrounds either a molten iron or iron sulfide core. This makes Io closer to the terrestrial planets in bulk composition than the satellites of the outer solar system. Io has a density of 3.5275 g/cm3, which is higher than any moon in the solar system and significantly higher than the other Galilean moons of Jupiter. It is denser than Earth’s Moon as well. Io played a large role in the development of astronomy. In the 17th and 18th centuries, the discovery of Io furthered to adoption of the Copernican model of the solar system – a Sun-centric system in which planets revolve around a relatively stationary Sun at the centre. It also furthered the development of Kepler’s law of motion – three scientific laws describing the motion of planets around the Sun – and the first measurement of the speed of light.